As Ghana has emerged as a world player in the cashew industry, Red River has increased our involvement in the country by making sure we have boots on the ground to closely monitor the market. How much knowledge did you have about cashews before you got to Africa? How did you first end up in Africa? 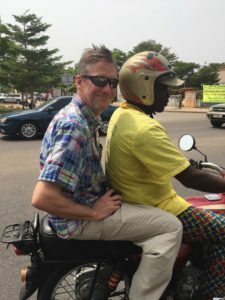 I joined the Peace Corps in Ghana from 2009-2011. At that time, I was the only Peace Corps Volunteer (PCV) working in the cashew industry in Ghana. For the first few months I really floundered. I had no clear directive on what I was doing or how to do it, so I decided I wanted to reach out to other players in the field to get some good information on best farming practices. Over the next year I focused on developing tools for the next PCV who would be put in my place once my time was up. I researched everything from how to prune cashew trees and best beekeeping practices to how to go about doing business in the industry. There were so many topics I wanted to gather information about for the person who was to take my place. My second year in the Peace Corps, I was having a beer with some friends and they asked me about my work in Africa. After a few more beers, I convinced them to help me develop a Peace Corps Cashew Initiative (PCCI). We worked hard to develop a constitution and bylaws. We even established a President, Vice President and Secretary. The focus was to educate any future PCVs on best farming practices. Most of the farmers I work with are very poor and I realized that by teaching them simple techniques like the pruning and thinning of trees, they could triple their income in a single year’s time. To be able to change lives like that- it was a big deal. That’s why we developed the PCCI. However, I didn’t expect it to last more than a year. That was in 2011 and now, by the end of this year, there will be over 30 people involved. PCCI is now a tremendous force of really excited PCVs working with farmers to increase livelihoods and change lives. By the end of the year there will be close to 30 PCVs. How did you meet Dan (President of RRF)? I met Dan through the African Cashew Alliance (ACA). He was touring the Brong Ahafo region in Ghana with the President of the ACA and they visited me in my village. As we talked over lunch, I gained a lot of respect for the way Red River conducts business and their vision for the future. They’re such a positive force in the industry. 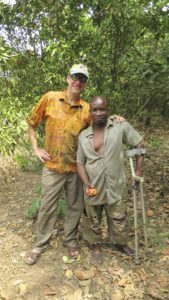 I supported Dan’s vision of being more involved in the African Cashew Industry by having boots on the ground. In May 2011 I finished my Peace Corps service. In September of that year I joined the Red River team and I currently lead our operations in Africa. Can you talk about some of the hurdles of operating in Africa? West Africa produces more cashews than anywhere else in the world but 95% of the unprocessed cashews (RCN) grown in Africa get shipped to India and Vietnam for processing. From there, the processed kernels are shipped to the US. It doesn’t make sense to do it this way. So, why wouldn’t Africa just process their own RCN? The answer is that most of the cashews are grown on smallholder farms so it’s a very rural setting. If you put a processing factory in a community that doesn’t understand a western style of work, of working 9am-5pm, you end up with a lot of problems. Infrastructure is also an issue. Electricity, water, roads, and government corruption pose massive hurdles to business. The cost of processing is higher in Africa than Vietnam and India due to the lack of economies of scale. However, now they’re starting to build up and we are also getting to a point where we understand the underlying factors as to why it’s so expensive and we’re addressing these issues. To give you an example, when we first started processing, everything was done by hand so you needed a tremendous workforce to produce large quantities of cashews. Now it’s more automated so this is helping to cut some of the production costs as well as helping to attain Food Safety Standards. Red River is very socially-minded which is why I joined the company in the first place. We have a partnership with the Peace Corps whereby RRF provides support through training, logistics, and equipment to run farmer training programs on best farming practices. Red River sponsors three training meetings per year with our field officers as well as PCVs and their counterparts where we educate on post-harvest handling. We also started a chainsaw program where we train selected farmers to use chainsaws in order to boost farmer income. This has been quite a big success. Red River purchased twelve chainsaws and we initiated the program in 12 different villages. In each village we brought in equipment (hats, boots, eye protection, etc) and a chainsaw. Though a chainsaw may seem like a pretty trivial tool, with it the farmers are able to triple, even quadruple their income by simply pruning their trees. We will be doing it again in July of this year. A PCV is requested by a community- the community comes to the Peace Corps and tells them they want a PCV in their village. Most villages PCVs work with are less than 1000 people. You live in a very modest room in a shared house with the local people and you’re there for 2 years. When I was a PCV I made $7 per day. I had to buy food, transportation, minutes for my phone, all with that $7 per day. As a PCV you live very humbly. You’re living in that village alongside the farmers you work with. A lot of the work is one-on-one with farmers but you’ll also do events with the whole village such as leading a class on how to manage the costs of your farm. While other nonprofits are able to provide support to these people, they are generally only in the villages for very short periods of time. With the 2 years that PCVs spend in the communities, they are able to really make a difference. 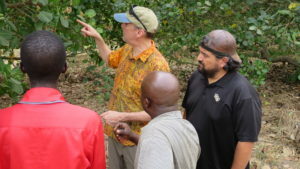 Can you discuss Red River’s recent joining of the African Cashew Initiative? RRF has been very supportive of African cashew industry associations such as ACA and ACI over the past 8 years. We acted as advisory board members of the ACA and recently joined the executive committee of the ACI. ACI has a lot of expertise in training farmers and helping processers reach a HAACP-certified quality standard. They also have a tremendous amount of valuable market information that we now have access to. As members, we now have a voice in some of the political management of the cashew business. It’s a constant struggle of two steps forward and two steps back. There have been times when we worked with factories that haven’t been able to complete the contract which creates a lot of frustrations. However, through a partnerships with companies such as MIM Cashew, we have been able to make some good strides. There is a lot of value that trickles down the supply chain. We help support their business financially so they have the money to buy the raw cashew nuts needed for processing. By Red River purchasing kernels from these companies, we are able to indirectly provide jobs in the community. It is a mutually beneficial relationship that is supporting not only the industry in this region but also the local communities. On an international basis I think Red River has more opportunity as well as respect from our customers in the US by having boots on the ground in Africa. Why? Because we can provide our customers with up-to-date firsthand market information. We know the accurate market prices, crop quality/size predictions, any current or foreseeable challenges, etc. This is information that is basically impossible to provide without having people on the ground. As shown from Wayne’s insight, Africa presents many challenges for business but we believe our presence there will become increasingly important for the development of the industry and our position as a market leader.